Johnnie Walker has released their first 50-year-old Scotch Whisky made from a blend of six whiskies all of which have been aged for a minimum of half a century. But as the saying goes, time is money, as each bottle will retail for US$25,000. 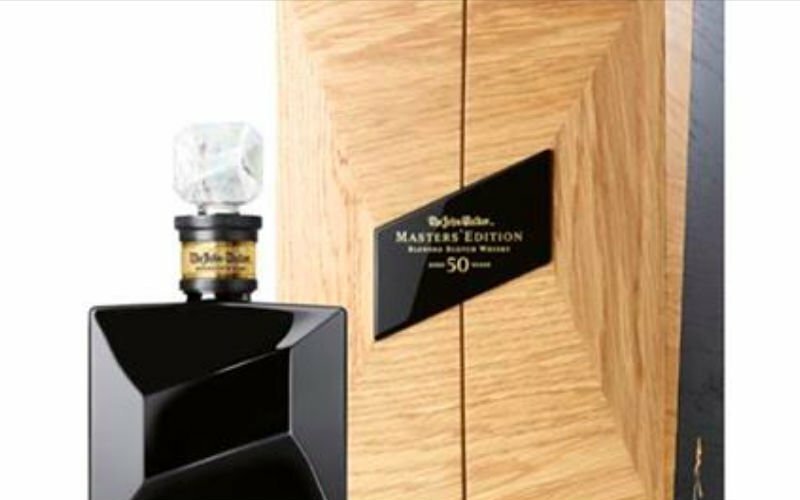 Only 100 bottles of the John Walker Masters’ Edition are being released, presented in individually numbered, double-cased black crystal Baccarat decanters that come packaged in an elegant, wooden box designed by cabinet maker to The Queen, N.E.J. Stevenson. The triple-matured Scotch whisky was made from some of the oldest available stocks within the Johnnie Walker family, including single malt whiskies from distilleries which have long closed their doors. Finished in small batches in a marrying cask made of 100-year-old oak staves, the flavours of the Scotch whisky are said to reveal themselves slowly on the palate. “Each drop of this whisky has been hand-selected from some of the most valuable and precious casks of malt and grain whiskies to be found in our reserves,” said Johnnie Walker Master Blender Jim Beveridge in a statement. Tasting notes describe blackcurrants and citrus giving way to rich, creamy, dark chocolate and a long, gentle warming finish of menthol and smokiness. The limited-edition bottles will be made available in limited, selected markets, at a retail price of US$25,000. One bottle will be auctioned at Bonhams, Hong Kong next year.